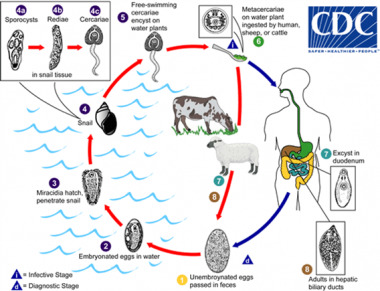 Life cycle of Fasciola hepatica. Immature Fasciola eggs are discharged in the biliary ducts and in the stool (1). Eggs become embryonated in water (2), eggs release miracidia (3), which invade a suitable snail intermediate host (4), including the genera Galba, Fossaria and Pseudosuccinea. 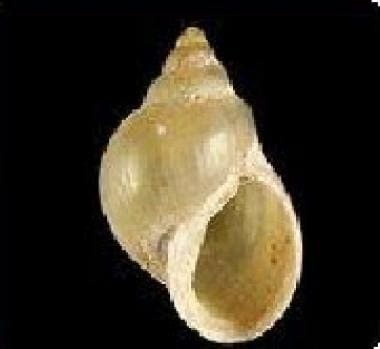 In the snail, the parasites undergo several developmental stages (sporocysts (4a), rediae (4b), and cercariae (4c)). The cercariae are released from the snail (5) and encyst as metacercariae on aquatic vegetation or other surfaces. Mammals acquire the infection by eating vegetation containing metacercariae. Humans can become infected by ingesting metacercariae-containing freshwater plants, especially watercress (6). After ingestion, the metacercariae excyst in the duodenum (7) and migrate through the intestinal wall, the peritoneal cavity, and the liver parenchyma into the biliary ducts, where they develop into adult flukes (8). Courtesy of the CDC's DPDx, Division of Parasitic Diseases and Malaria. In humans, maturation from metacercariae into adult flukes takes approximately 3 to 4 months. 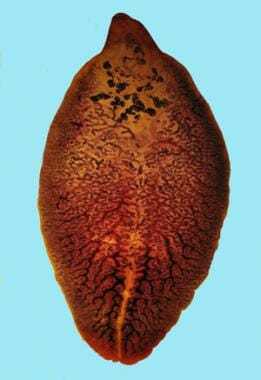 The adult flukes (Fasciola hepatica: up to 30 mm by 13 mm; F. gigantica: up to 75 mm) reside in the large biliary ducts of the mammalian host. Fasciola hepatica infect various animal species, mostly herbivores (plant-eating animals). Adult Fasciola hepatica fluke stained with carmine (30 mm by 13 mm). Courtesy of the CDC's DPDx, Division of Parasitic Diseases and Malaria. Fossaria bulamoides, a snail host for F hepatica in the western United States. Courtesy of the CDC's DPDx, Division of Parasitic Diseases and Malaria (Conchology, Inc, Mactan Island, Philippines). Up to 17 million cases have been estimated to be affected with fascioliasis worldwide. [9, 10] F. hepatica typically occurs worldwide in temperate regions, except Oceania. F. gigantica causes outbreaks in tropical areas of Southern Asia,  Southeast Asia, and Africa. Infection is most prevalent in regions with intensive sheep and cattle production. Miracidia require temperate water to develop and hatch. In a study of approximately 3,000 Egyptian children, 3% were infected. Many were severely anemic. Among individuals who presented with fever of unknown origin to an Egyptian hospital, 4% had F. hepatica. F. hepatica caused disease that formerly occurred in scattered endemic foci along the Nile River and has now spread throughout the Nile Valley. A distinct syndrome of fascioliasis, termed halzoun in Lebanon and marrerra in the Sudan, can result from consuming raw livers of infected sheep, goats, or cows. The living fluke adheres to the posterior pharyngeal wall, causing severe pharyngitis and laryngeal edema. Similarly, disease can follow consumption of sashimi of bovine liver served in "Yakitori" bars in Japan, if the liver is contaminated with juvenile worms. Because of the large numbers of people infected worldwide, fascioliasis causes considerable morbidity. In children, fascioliasis is often associated with severe anemia, although it is seldom fatal. Fascioliasis infection has no apparent racial predilection. Approximately 60% of infections occur in males, which may reflect occupational, dietary, or recreational exposures. Although most reported patients are adults, fascioliasis appears to equally affect people of all ages. Some geographic difference is observed in the age-related incidence of the disease; for example, it is rarely reported in children in Turkey. Tolan RW Jr. Fascioliasis due to Fasciola hepatica and Fasciola gigantica infection: an update on this 'neglected' neglected tropical disease. Lab Med. 2011 Feb. 42(2):107-117. Fürst T, Duthaler U, Sripa B, Utzinger J, Keiser J. Trematode infections: liver and lung flukes. Infect Dis Clin North Am. 2012 Jun. 26(2):399-419. [Medline]. Cabada MM, White AC Jr. New developments in epidemiology, diagnosis, and treatment of fascioliasis. Curr Opin Infect Dis. 2012 Oct. 25(5):518-22. [Medline]. Ashrafi K, Bargues MD, O'Neill S, Mas-Coma S. Fascioliasis: a worldwide parasitic disease of importance in travel medicine. Travel Med Infect Dis. 2014 Nov-Dec. 12(6 Pt A):636-49. [Medline]. Weisenberg SA, Perlada DE. Domestically acquired fascioliasis in northern California. Am J Trop Med Hyg. 2013 Sep. 89(3):588-91. [Medline]. [Full Text]. Fried B, Abruzzi A. Food-borne trematode infections of humans in the United States of America. Parasitol Res. 2010 May. 106(6):1263-80. [Medline]. Nutman TB, Ottesen EA, Ieng S, Samuels J, Kimball E, Lutkoski M, et al. Eosinophilia in Southeast Asian refugees: evaluation at a referral center. J Infect Dis. 1987 Feb. 155(2):309-13. [Medline]. Fürst T, Keiser J, Utzinger J. Global burden of human food-borne trematodiasis: a systematic review and meta-analysis. Lancet Infect Dis. 2012 Mar. 12(3):210-21. [Medline]. Youn H. Review of zoonotic parasites in medical and veterinary fields in the Republic of Korea. Korean J Parasitol. 2009 Oct. 47 Suppl:S133-41. [Medline]. Haseeb AN, el-Shazly AM, Arafa MA, Morsy AT. A review on fascioliasis in Egypt. J Egypt Soc Parasitol. 2002 Apr. 32(1):317-54. [Medline]. Lopez M, White AC Jr, Cabada MM. Burden of Fasciola hepatica Infection among Children from Paucartambo in Cusco, Peru. Am J Trop Med Hyg. 2012 Mar. 86(3):481-5. [Medline]. Mas-Coma S, Bargues MD, Valero MA. Fascioliasis and other plant-borne trematode zoonoses. Int J Parasitol. 2005 Oct. 35(11-12):1255-78. [Medline]. Chand MA, Herman JS, Partridge DG, Hewitt K, Chiodini PL. Imported human fascioliasis, United kingdom. Emerg Infect Dis. 2009 Nov. 15(11):1876-7. [Medline]. Mas-Coma, S, Valero, M.A., Bargues, M.D. Fascioliasis. Toledo, R, Fried, B. Advances in experimental medicine and Biology. Digenetic Trematodes. New York: Springer; 2014. 77-114. Mas-Coma S, Agramunt VH, Valero MA. Neurological and ocular fascioliasis in humans. Adv Parasitol. 2014. 84:27-149. [Medline]. Dreyfuss G, Vignoles P, Rondelaud D. Fasciola hepatica: epidemiological surveillance of natural watercress beds in central France. Parasitol Res. Mar 2005. 95(4):278-82. [Medline]. Rodríguez-Ulloa C, Rivera-Jacinto M, Del Valle-Mendoza J, Cerna C, Hoban C, Chilón S, et al. Risk factors for human fascioliasis in schoolchildren in Baños del Inca, Cajamarca, Peru. Trans R Soc Trop Med Hyg. 2018 May 31. [Medline]. el-Shabrawi M, el-Karaksy H, Okasha S, el-Hennawy A. Human fascioliasis: clinical features and diagnostic difficulties in Egyptian children. J Trop Pediatr. 1997 Jun. 43(3):162-6. [Medline]. Keiser J, Duthaler U, Utzinger J. Update on the diagnosis and treatment of food-borne trematode infections. Curr Opin Infect Dis. 2010 Oct. 23(5):513-20. [Medline]. Ubeira FM, Muiño L, Valero MA, Periago MV, Pérez-Crespo I, Mezo M. MM3-ELISA detection of Fasciola hepatica coproantigens in preserved human stool samples. Am J Trop Med Hyg. 2009 Jul. 81(1):156-62. [Medline]. Fascioliasis. DPDx: Centers for Disease Control and Prevention. Available at http://www.cdc.gov/dpdx/fascioliasis/dx.html. Accessed: March 10, 2015. Ai L, Dong SJ, Zhang WY, et al. Specific PCR-based assays for the identification of Fasciola species: their development, evaluation and potential usefulness in prevalence surveys. Ann Trop Med Parasitol. 2010 Jan. 104(1):65-72. [Medline]. Le TH, Nguyen KT, Nguyen NT, Doan HT, Le XT, Hoang CT, et al. Development and evaluation of a single-step duplex PCR for simultaneous detection of Fasciola hepatica and Fasciola gigantica (family Fasciolidae, class Trematoda, phylum Platyhelminthes). J Clin Microbiol. 2012 Aug. 50(8):2720-6. [Medline]. [Full Text]. Chamadol N, Laopaiboon V, Techasatian P, Sukeepaisanjaroen W, Sripanuskul A. Computerized tomographic findings of hepatic fascioliasis compared with melioidosis-caused liver abscesses. J Med Assoc Thai. 2010 Jul. 93(7):838-48. [Medline]. Cantisani V, Cantisani C, Mortele K, et al. Diagnostic imaging in the study of human hepatobiliary fascioliasis. Radiol Med. 2010 Feb. 115(1):83-92. [Medline]. Parasites - Fascioliasis (Fasciola Infection). Centers for Disease Control and Prevention. Available at http://www.cdc.gov/parasites/fasciola/health_professionals/index.html. Accessed: February 26, 2015. Apt W, Aguilera X, Vega F, Miranda C, Zulantay I, Perez C, et al. Treatment of human chronic fascioliasis with triclabendazole: drug efficacy and serologic response. Am J Trop Med Hyg. 1995 Jun. 52(6):532-5. [Medline]. el-Morshedy H, Farghaly A, Sharaf S, Abou-Basha L, Barakat R. Triclabendazole in the treatment of human fascioliasis: a community-based study. East Mediterr Health J. 1999 Sep. 5(5):888-94. [Medline]. Winkelhagen AJ, Mank T, de Vries PJ, Soetekouw R. Apparent triclabendazole-resistant human Fasciola hepatica infection, the Netherlands. Emerg Infect Dis. 2012 Jun. 18(6):1028-9. [Medline]. [Full Text]. Favennec L, Jave Ortiz J, Gargala G, Lopez Chegne N, Ayoub A, Rossignol JF. Double-blind, randomized, placebo-controlled study of nitazoxanide in the treatment of fascioliasis in adults and children from northern Peru. Aliment Pharmacol Ther. 2003 Jan. 17(2):265-70. [Medline]. McGurie JH. Trematodes (Schistosomes and Liver, Intestinal, and Lung Flukes). Bennett, JE, Dolin, R, Blaser, M. Mandell, Douglas, and Bennett's Principles and Practice of Infectious Diseases. 8th Edition. Philadelphia: Elsevier; 2015. 3216-26. Zumaquero-Ríos JL, Sarracent-Pérez J, Rojas-García R, Rojas-Rivero L, Martínez-Tovilla Y, Valero MA, et al. Fascioliasis and intestinal parasitoses affecting schoolchildren in Atlixco, Puebla State, Mexico: epidemiology and treatment with nitazoxanide. PLoS Negl Trop Dis. 2013 Nov. 7(11):e2553. [Medline]. [Full Text]. Apt W, Aguilera X, Vega F, et al. Treatment of human chronic fascioliasis with triclabendazole: drug efficacy and serologic response. Am J Trop Med Hyg. Jun 1995. 52(6):532-5. [Medline]. Falcón CR, Carranza FA, Aoki P, Motrán CC, Cervi L. Adoptive Transfer of Dendritic Cells Pulsed With Fasciola hepatica Antigens and Lipopolysaccharides Confers Protection Against Fasciolosis in Mice. J Infect Dis. 2012 Feb. 205(3):506-14. [Medline]. Leon M, Alave J, Alvarado R, Gotuzzo E, Terashima A, Seas C. A 52-year-old woman with a subcapsular liver hematoma. Clin Infect Dis. 2011 May. 52(9):1137, 1195-6. [Medline]. Alatoom A, Cavuoti D, Southern P, Gander R. Fasciola hepatica infection in the United States. Lab Med. July, 2008. 39(7):425-8. [Full Text]. Arauco R, Zetola NM, Calderon F, Seas C. Human fascioliasis: a case of hyperinfection and an update for clinicians. Foodborne Pathog Dis. 2007. 4(3):305-12. [Medline]. Arjona R, Riancho JA, Aguado JM, Salesa R, Gonzalez-Macias J. Fascioliasis in developed countries: a review of classic and aberrant forms of the disease. Medicine (Baltimore). 1995 Jan. 74(1):13-23. [Medline]. Ashrafi K, Valero MA, Massoud J, et al. Plant-borne human contamination by fascioliasis. Am J Trop Med Hyg. Aug 2006. 75(2):295-302. [Medline]. Bacq Y, Besnier JM, Duong TH, et al. Successful treatment of acute fascioliasis with bithionol. Hepatology. 1991 Dec. 14(6):1066-9. [Medline]. Bunnag D, Bunnag T, Goldsmith R. Liver fluke infections. Hunter's Tropical Medicine. 1991. 818-27. Cheng AC, Zakhidov BO, Babadjonova LJ, Rogers NK, McCollum CJ, Hillyer GV. A 6-year-old boy with facial swelling and monocular blindness. Clin Infect Dis. 2007 Nov 1. 45(9):1207, 1238-9. [Medline]. Clark BM, Lloyd BA, Christopher GW, Foody WF. A young man from Peru with fever and abdominal pain. Clin Infect Dis. 2005 Mar 15. 40(6):842-3, 879-80. [Medline]. Dowidar N, El Sayad M, Osman M, Salem A. Endoscopic therapy of fascioliasis resistant to oral therapy. Gastrointest Endosc. 1999 Sep. 50(3):345-51. [Medline]. Dreyfuss G, Rondelaud D. Biodiversity of flukes. Parasite. 2008 Sep. 15(3):282-5. [Medline]. el-Karaksy H, Hassanein B, Okasha S, Behairy B, Gadallah I. Human fascioliasis in Egyptian children: successful treatment with triclabendazole. J Trop Pediatr. 1999 Jun. 45(3):135-8. [Medline]. Espinoza JR, Maco V, Marcos L, Saez S, Neyra V, Terashima A. Evaluation of Fas2-ELISA for the serological detection of Fasciola hepatica infection in humans. Am J Trop Med Hyg. 2007 May. 76(5):977-82. [Medline]. Graham CS, Brodie SB, Weller PF. Imported Fasciola hepatica Infection in the United States and Treatment with Triclabendazole. Clin Infect Dis. Jul 1 2001. 33(1):1-5. [Medline]. Gökçe M, Sahiner U, Unal S, Parlakay A, Oncel I, Saçkesen C, et al. An unexpected parasitic cause of hypereosinophilia: fascioliasis. Turk J Pediatr. 2011 Jan-Feb. 53(1):111-3. [Medline]. Hien TT, Truong NT, Minh NH, et al. A randomized controlled pilot study of artesunate versus triclabendazole for human fascioliasis in central Vietnam. Am J Trop Med Hyg. 2008 Mar. 78(3):388-92. [Medline]. Hillyer GV, Soler de Galanes M, Rodriguez-Perez J, Bjorland J, Silva de Lagrava M, Ramirez Guzman S, et al. Use of the Falcon assay screening test--enzyme-linked immunosorbent assay (FAST-ELISA) and the enzyme-linked immunoelectrotransfer blot (EITB) to determine the prevalence of human fascioliasis in the Bolivian Altiplano. Am J Trop Med Hyg. 1992 May. 46(5):603-9. [Medline]. Kabaalioglu A, Apaydin A, Sindel T, Luleci E. US-guided gallbladder aspiration: a new diagnostic method for biliary fascioliasis. Eur Radiol. 1999. 9(5):880-2. [Medline]. Kaewpitoon N, Kaewpitoon SJ, Pengsaa P, Pilasri C. Knowledge, attitude and practice related to liver fluke infection in northeast Thailand. World J Gastroenterol. 2007 Mar 28. 13(12):1837-40. [Medline]. Karabuli TA, Shaikhani MA, Karadaghi SH, Kasnazan KH. Education and imaging. Hepatobiliary and pancreatic: fascioliasis. J Gastroenterol Hepatol. 2009 Jul. 24(7):1309. [Medline]. Katz M, Despommier DD, Gwadz RW. Fasciola hepatica. Parasitic Diseases. 1989. 112-6. Keiser J, Utzinger J. Chemotherapy for major food-borne trematodes: a review. Expert Opin Pharmacother. 2004 Aug. 5(8):1711-26. [Medline]. Le TH, De NV, Agatsuma T, Blair D, Vercruysse J, Dorny P. Molecular confirmation that Fasciola gigantica can undertake aberrant migrations in human hosts. J Clin Microbiol. 2007 Feb. 45(2):648-50. [Medline]. Lim JH, Kim SY, Park CM. Parasitic diseases of the biliary tract. AJR Am J Roentgenol. 2007 Jun. 188(6):1596-603. [Medline]. Lim JH, Mairiang E, Ahn GH. Biliary parasitic diseases including clonorchiasis, opisthorchiasis and fascioliasis. Abdom Imaging. 2008 Mar-Apr. 33(2):157-65. [Medline]. Lopez-Velez R, Dominguez-Castellano A, Garron C. Successful treatment of human fascioliasis with triclabendazole. Eur J Clin Microbiol Infect Dis. Jul 1999. 18(7):525-6. [Medline]. MacLean JD, Cross J, Mahanty S. Liver, lung, and intestinal fluke infections. Tropical Infectious Diseases: Principles, Pathogens, & Practice. 1999. 1039-57. Makay O, Gurcu B, Caliskan C, Nart D, Tuncyurek M, Korkut M. Ectopic fascioliasis mimicking a colon tumor. World J Gastroenterol. 2007 May 14. 13(18):2633-5. [Medline]. Mannstadt M, Sing A, Leitritz L, Brenner-Maucher K, Bogner J. Conservative management of biliary obstruction due to Fasciola hepatica. Clin Infect Dis. 2000 Nov. 31(5):1301-3. [Medline]. Mansour-Ghanaei F, Shafaghi A, Fallah MS. The effect of metronidazole in treating human fascioliasis. Med Sci Monit. Oct 2003. 9(10):PI127-30. [Medline]. Marcos L, Maco V, Samalvides F. Risk factors for Fasciola hepatica infection in children: a case-control study. Trans R Soc Trop Med Hyg. Feb 2006. 100(2):158-66. [Medline]. Marcos LA, Tagle M, Terashima A, et al. Natural history, clinicoradiologic correlates, and response to triclabendazole in acute massive fascioliasis. Am J Trop Med Hyg. 2008 Feb. 78(2):222-7. [Medline]. Marcos LA, Terashima A, Gotuzzo E. Update on hepatobiliary flukes: fascioliasis, opisthorchiasis and clonorchiasis. Curr Opin Infect Dis. 2008 Oct. 21(5):523-30. [Medline]. McManus DP, Dalton JP. Vaccines against the zoonotic trematodes Schistosoma japonicum, Fasciola hepatica and Fasciola gigantica. Parasitology. 2006. 133 Suppl:S43-61. [Medline]. Nguyen TG, Le TH, De NV, et al. Assessment of a 27-kDa antigen in enzyme-linked immunosorbent assay for the diagnosis of fasciolosis in Vietnamese patients. Trop Med Int Health. 2010 Apr. 15(4):462-7. [Medline]. Noyer CM, Coyle CM, Werner C, et al. Hypereosinophilia and liver mass in an immigrant. Am J Trop Med Hyg. 2002 Jun. 66(6):774-6. [Medline]. [Full Text]. Pearson RD, Weller PF, Guerrant. Chemotherapy of parasitic diseases. Tropical Infectious Diseases: Principles, Pathogens, & Practice. 1999. 215-37. Pilsczek FH. Helminthic infections mimicking malignancy: a review of published case reports. J Infect Dev Ctries. 2010 Aug 4. 4(7):425-9. [Medline]. Price TA, Tuazon CU, Simon GL. Fascioliasis: case reports and review. Clin Infect Dis. 1993 Sep. 17(3):426-30. [Medline]. Rana SS, Bhasin DK, Nanda M, Singh K. Parasitic infestations of the biliary tract. Curr Gastroenterol Rep. 2007 Apr. 9(2):156-64. [Medline]. Richter J, Knipper M, Gobels K. Fascioliasis. Curr Treatment Options Infect Dis. 2002. 4:313-7. Sripa B, Kaewkes S, Intapan PM, Maleewong W, Brindley PJ. Food-borne trematodiases in Southeast Asia epidemiology, pathology, clinical manifestation and control. Adv Parasitol. 2010. 72:305-50. [Medline]. Sripa B, Kaewkes S, Sithithaworn P, Mairiang E, Laha T, Smout M. Liver fluke induces cholangiocarcinoma. PLoS Med. 2007 Jul. 4(7):e201. [Medline]. Talaie H, Emami H, Yadegarinia D, Nava-Ocampo AA, Massoud J, Azmoudeh M, et al. Randomized trial of a single, double and triple dose of 10 mg/kg of a human formulation of triclabendazole in patients with fascioliasis. Clin Exp Pharmacol Physiol. 2004 Nov. 31(11):777-82. [Medline]. Tantrawatpan C, Maleewong W, Wongkham C, et al. Serodiagnosis of human fascioliasis by a cystatin capture enzyme-linked immunosorbent assay with recombinant Fasciola gigantica cathepsin L antigen. Am J Trop Med Hyg. 2005 Jan. 72(1):82-6. [Medline]. [Full Text]. Turner JA. Trematodes. Textbook of Pediatric Infectious Diseases. 2004. 2817-25. Valero MA, Santana M, Morales M, et al. Risk of gallstone disease in advanced chronic phase of fascioliasis: an experimental study in a rat model. J Infect Dis. Sep 1 2003. 188(5):787-93. [Medline]. Villegas F, Angles R, Barrientos R, Barrios G, Valero MA, Hamed K, et al. Administration of triclabendazole is safe and effective in controlling fascioliasis in an endemic community of the Bolivian Altiplano. PLoS Negl Trop Dis. 2012. 6(8):e1720. [Medline]. [Full Text]. Walker SM, McKinstry B, Boray JC, et al. Response of two isolates of Fasciola hepatica to treatment with triclabendazole in vivo and in vitro. Parasitol Res. Dec 2004. 94(6):427-38. [Medline]. Winkelhagen AJ, Mank T, de Vries PJ, Soetekouw R. Apparent Triclabendazole-Resistant Human Fasciola hepatica Infection, the Netherlands. Emerg Infect Dis. 2012 Jun. 18(6):1028-9. [Medline]. Xuan le T, Hung NT, Waikagul J. Cutaneous fascioliasis: a case report in Vietnam. Am J Trop Med Hyg. 2005 May. 72(5):508-9. [Medline]. [Full Text]. Yi-Zhu X, Zhi-Bang Y. A case of ectopic fascioliasis in the skin. Trop Doct. 2010 Oct. 40(4):253-4. [Medline]. Fasciola hepatica egg in an unstained wet mount (400x magnification). F hepatica eggs are broadly ellipsoidal, operculated, and measure 130-150 μm by 60-90 μm. Courtesy of the CDC's DPDx, Division of Parasitic Diseases and Malaria. Adult of F hepatica observed with ERCP imaging in the common bile duct of a human patient. Courtesy of the CDC's DPDx, Division of Parasitic Diseases and Malaria (Dr. Subhash Agal, Kokilaben Dhirubhai Ambani Hospital, Mumbai, India).